Bravura Gold Resort Presents HOLI MANIA on 21st March, 2019. Enjoy more than 60 types of Veg & Non-Veg Dishes, Live Snacks, Desserts, Salads & Beverages from different regions at “The Recipes”. Dinner Buffet at Just Rs. 799/- (inclusive GST) and 20% Discount at Bottles ‘n’ Barrels (New Exclusive Pub). So Join in with your family & friends. 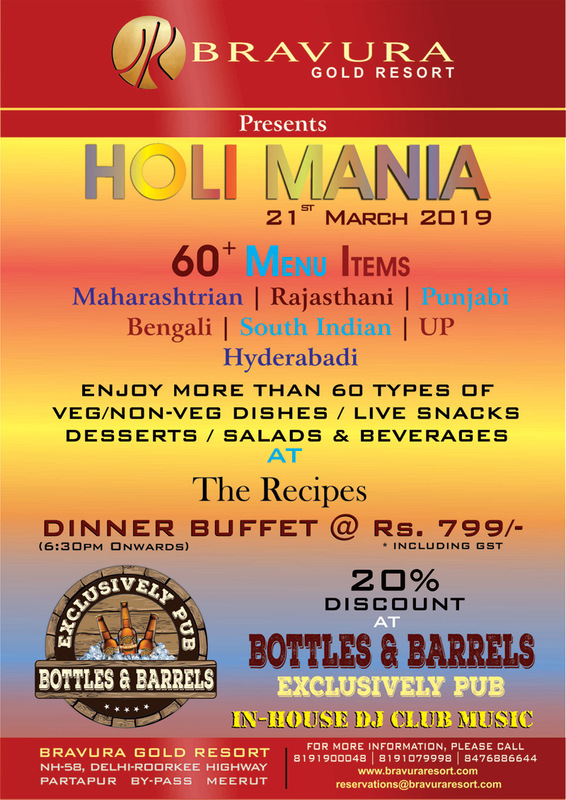 Previous PostEnjoy Happy Hours at Bottles ‘n’ Barrels (New Exclusive Pub) with Buy 2 Get 1 Free.Next PostBravura Gold Resort Presents CRICKET MANIA (23rd March to 5th May, 2019).